Here are several tips that will affect rice head yields, according to different studies. Varietal characteristics includes physical and chemical characteristics of grain, time of maturity, and uniformity of ripening. Time of planting. 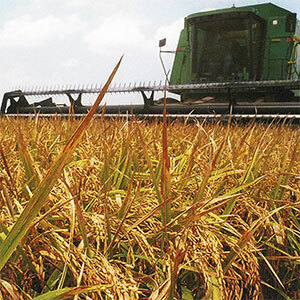 Early plantings of non-photoperiod sensitive varieties result in grain ripening during periods of wide day/night temperatures or high daytime temperatures which does not favor high rice head yields. Seeding rates and plant density. High plant densities can increase stem rot severity resulting in chalky kernels. Low plant densities cause increased tillering, non-synchrosous heading, and variation in grain maturation. Nitrogen fertilization. Late top-dressing may stimulate late tillering and production of immature panicles with chalky kernels, while excess nitrogen increases stem rot. Environmetal conditions during grain filling and maturation. High temperatures increase respiration, reduce the supply of plant carbohydrates, cause poor filling and chalky kernels; sun checking reduces solar radiation (or mutual shading), and grain quality. Wide day and night temperature differences cause chalkkiness, and low humidity and dry winds cause kernels to dry too rapidly, causing cracks to develop in grain. Field drainage prior to harvest. Early drainage results in shriveled and pinched grain which is prone to breakage. Late drainage results in low grain moisture content at harvest resulting in lower head yields. Harvesting at proper grain moisture percentage. Harvest at 20-24% moisture for highest rice head yields. Use proper combine cutting height, cylinder clearance and speeds to minimize mechanical damage to kernels during harvest. Reduce cylinder speeds for long grains to 450-550 RPM. Conditions of drying, tempering, and storage. Rate of drying and tempering of grain affects head yields. Reabsorption of moisture during storage decreases head yields. Milling and processing conditions. Moisture percentage during milling affects quality. Uniform seed size is essential to proper milling, while mixing different sized varieties may result in lower head yield.